If its for a special one its ought to be special itself and not just like any other general card. Not that I mean disrespect to the people who do not give personalized photo cards, neither it is to say that " - people who give general cards love less - Its just that people who give personalized photo cards - love a little more ! ( I feel ! )- ". Remember, the card you give speak volumes about you. 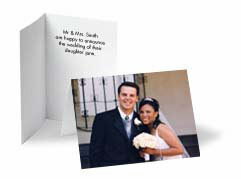 Let it not remain just an ordinary Card - Personalize it - put emotions in it and see the difference. 2) And secondly, they are not expensive at all. I do not have to worry about loosing my shirt whenever it comes to giving a very " special gift ". I firmly believe that money can never make a gift " Special " - It is your feelings and your emotions that make it special. I'll give you one of the best examples of a real Heart-Touching Gift that I received recently. 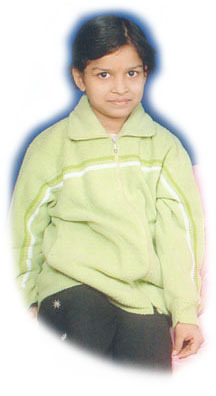 The little girl that you see in the picture below is my 'Bhanu'. Bhanu is an 11 year old angel blessed to one of my best friends, Devki. I know Bhanu from the time she was 6. Today she is 11 and you know what? No matter if anybody remembers it or not but she remembers my birthday every year. Each year she gives me gifts beautifully crafted and hand-made by her with utmost care and love for her 'Sanjiv Uncle' (that's me!). For her, 'Sanjiv Uncle' is her best friend in this world and so is 'Bhanu' for her Sanjiv Uncle. This year I was away from her for the whole year and was not there with her on my birthday. But who says so ? For her, it makes no difference where I am - her love and heart reaches me anywhere in the world. You know what she sent me this year? 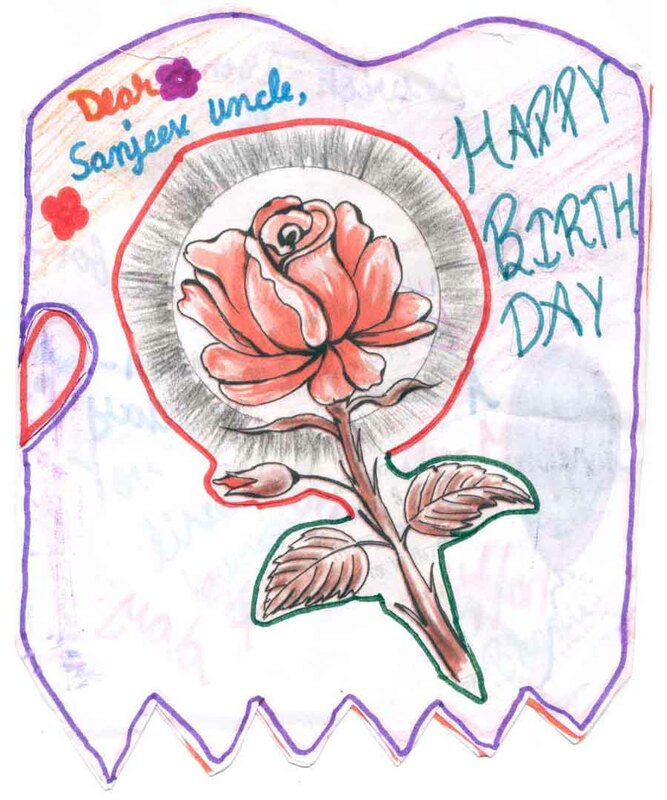 She sent one of the most unique gifts that I have ever received - a very personalized birthday card along with a beautiful photo gift... for her 'Sanjiv Uncle'. I don't know if I'll live up to that period or not but those lines were enough to move me beyond expectations. I could not control myself and was moved to tears... I really had nothing to say. 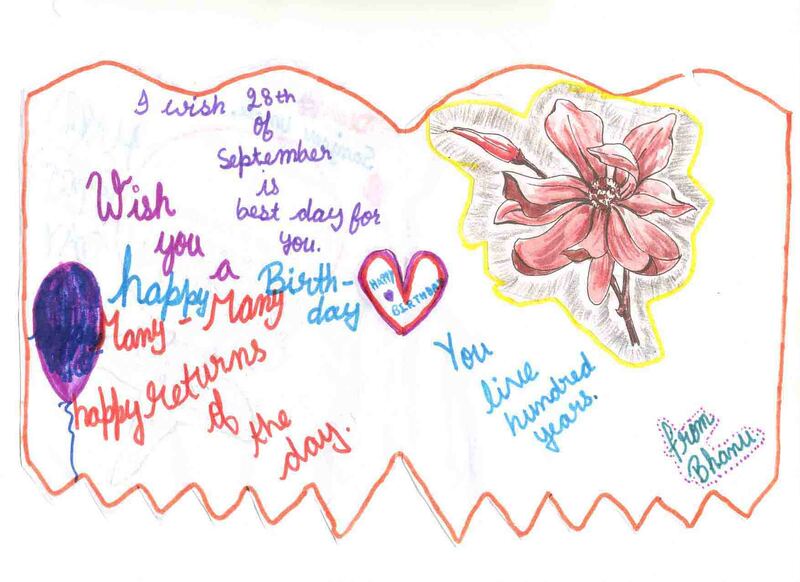 Its not that I have not received cards before, but this was really special. It was not any ordinary card. It had my Bhanu in it. It had all her feelings, all her emotions and all her love in it. It really was not just a card - it was something beyond it... something really more. I must confess again, that some gifts... are not just gifts... they are emotions... and that's what my Bhanu has for her Sanjiv uncle. Let your cards be the voice of your heart. Make them say what you want to say in the most special and unique way. The three word sentence 'I Love You' may look very simple to read and maybe very easy to speak as well, but in reality it is not so simple to express. After-all what really matters is how you say what you want to say, and I believe that if your gift has not reached the heart of the receiver...it has reached nowhere. 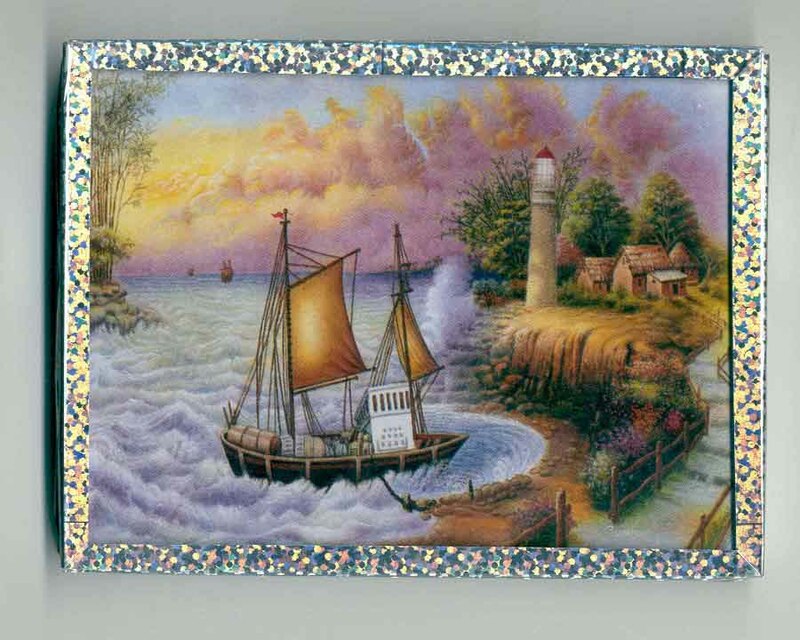 It is here that your cards give a voice to your emotions. 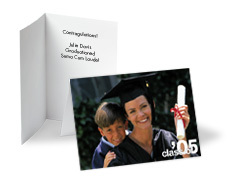 From my personal experience I can say this with guarantee that a personalized photo card is thousand times more touching and expressive than any other general card. They make you live and re-live those wonderful moments for days, months and even years.
" ..If a few simple and easy steps on your part can bring a smile and make the day of the person you love - is it not worth taking them? "..If it can help them remember you for long and bring them closer to you - is it not worth taking those simple steps? I feel it is - It is worth taking such steps that bind your families together - that brings them closer to each other's hearts and make them feel special and proud to be a part of your family. That's what a true Gift is. So many advantages and so less the price and effort that you put. Isn't it Great !, and what about the results? Well, its bound to be phenomenal - really unbelievable. The biggest advantage: it touches the heart and soul of the people you send them to and brings your loved ones close to you. The next biggest advantage: it is the most unique and personal way or form of expression. Imagine the smile and happiness on the face of the people who'll receive your personalized photo card and what effect will it have on their minds, heart and soul. The third advantage: it is very easy to create. All you have to do is take simple steps like a, b, c and d and you're done and here are those a, b, c and d (s) for you. 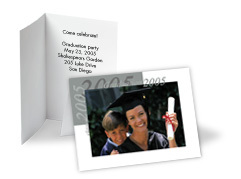 Upload your photo (any photo that makes this occasion memorable). Select the card out of the many many choices that are available to you. 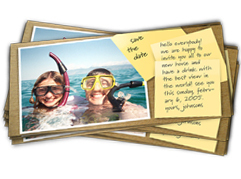 Type in your own highly personalized message for your special someone ! 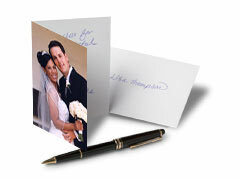 Write the address on which to send your personalized cards. 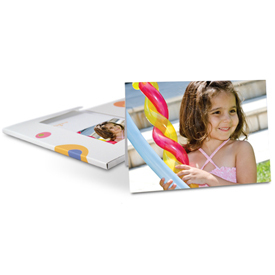 That's it, and your most personalized photo cards would reach you or the person you addressed to in a few days from now!. Isn't it Great ! Oh!, Did I mention an important advantage? they are REAL CARDS and NOT an e-card, so its not only for your boyfriend or girlfriend who can receive it in their laptops but also for your old grandma who may not have access to computer at all. 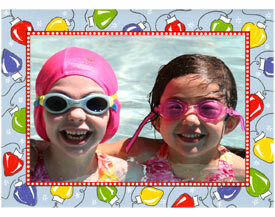 Send your personalized cards by post to any place in the world and make it a day ...worth remembering. Farewell Cards... the list can go on 'n on. It could be just because you felt like sending a card to someone special to you. Whatever be the reason, my guarantee is that a Personalized Photo Card Will make a definite difference in the way people know you. Still don't believe me ? Send one card and see. You'll know what I mean.